This page is a translated version of the page Unic and the translation is 100% complete. 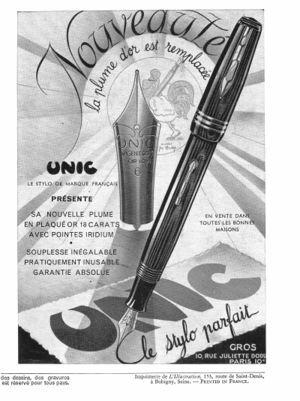 Unic was founded in 1919 by M. M. Kothe and Vannier, but few details are known of the company. The company initially produced good quality hard rubber pens both safety and lever filler, and safeties were also produced with the Omnia trademark. It is particularly distinguished for the quality of the versions decorated with laminated silver, gold overlay. It is best known for marketing in 1932 the Duocolor, a double pen allowing you to either use two separated pens loaded with different colors. This pen is identical to Zerollo and in essence is nothing more than a rebranding of the Genoese company products. As for Zerollo the pen had limited success, because of the mechanical fragility due to the considerable complexity of the same, and the relative utility of the solution. It was also expensive, so in the end a few were produced, and is therefore one of the most sought after and most expensive French pens. ↑ the connection is proved, apart from the similarity of the typeface used on the name imprint, by a 1934 invoice showed in this discussion. This page was last edited on 3 March 2018, at 01:24.